Toymaker Jakks Pacific said its Elsa and Anna dresses and dolls are selling out as soon as they hit stores. Families have taken multiple trips to the theater to watch the movie, helping Frozen gross over $1 billion in the worldwide box office. It has become Disney's (DIS) highest-grossing animated film of all time. It has created such a frenzy that all versions of Queen Elsa's sparkling ice-blue dress from the movie are sold out in U.S. stores. But on eBay, desperate parents can shell out over $1,000 to grab a limited-edition version of the dress that cost $149.95 when it first hit Disney stores in mid-November. A cheaper version made by toy maker Jakks Pacific (JAKK), which originally retailed for $20, is also selling on eBay for between $150 and $350. Frozen fever is not limited to Elsa. Disney's limited-edition character dolls of Elsa and her sister Anna, priced at $99.95 each, sold out within 45 minutes after they launched on disneystore.com in January. On eBay (EBAY), bids for the limited edition dolls range from a few hundred dollars to over $3,000. Disney's Frozen storybook app is a top-performing app in the kid's category in over 100 countries while Disney's book "Frozen", based on the movie, is already a New York Times bestseller. "Frozen is a global phenomenon that has truly exceeded our expectations on every level," said Disney spokeswoman Margita Thompson. "We're thrilled that audiences formed an instant connection with the characters." Eager to capitalize on the demand, Disney is taking unusual steps -- such as airlifting inventory from overseas -- to expedite shipments of Frozen-themed products to its more than 200 U.S. stores. It's also expanding the Frozen brand into sporting goods and electronics. Stephen Berman, co-founder of Jakks Pacific, anticipates that the Frozen license could become "one of the best properties we've ever had." 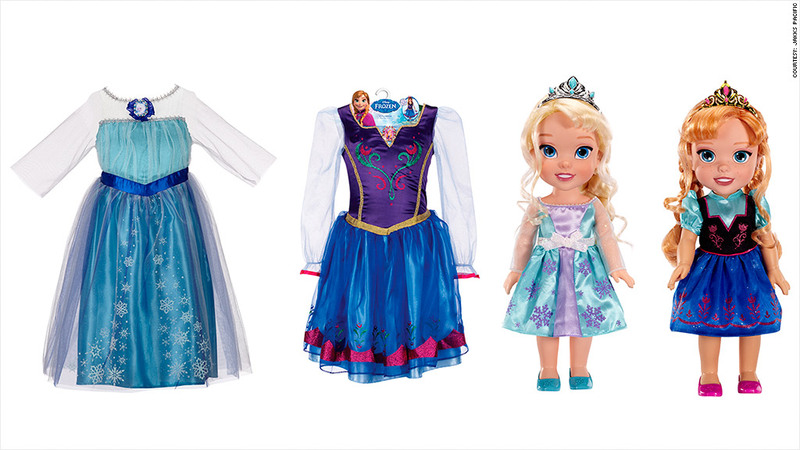 Jakks Pacific has the license for Frozen character baby and toddler dolls, costumes and toys, which it supplies to leading retailers including Wal-Mart (WMT), Target (TGT)and Toys R Us. The Elsa and Anna dresses and dolls are shipped out continuously, "but they sell out as soon as we get more into stores," he said. Berman said Jakks' plans to expand its Frozen offerings. In the fall, the company will unveil a singing interactive Elsa doll and dress. And Jakks' Halloween costume unit is already ramping up production of Elsa, Anna and Olaf costumes, which he expects will be top sellers. "Frozen is turning into an evergreen property that we'll nurture with Disney for a very long time," he said.